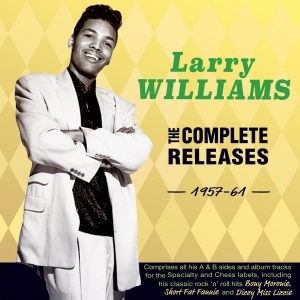 Larry Williams was a blues, R&B and rock ‘n’ roll singer from New Orleans, who was a contemporary and close associate of Little Richard and Lloyd Price, and who registered a series of influential landmark rock ‘n’ roll hits during the late ‘50s with “Short Fat Fannie”, “Bony Moronie” and “Dizzy Miss Lizzie”. He worked as a chauffeur for Lloyd price for a while, as well as playing in the his band and those of Roy Brown and Percy Mayfield, and through his connections with Price and Little Richard got a deal with the Specialty label. When Little Richard quit rock ‘n’ roll to take up the ministry, producer Robert Blackwell groomed Williams to step into his shoes, and in 1959 he scored Top 10 R&B and pop hits with “Short Fat Fannie” and Bony Moronie”. He could not maintain the flow of hits, but recorded many classics which were later recorded by major artists, with The Beatles reviving “Dizzy Miss Lizzie”, “Slow Down” and “Bad Boy” and The Rolling Stones recording “She Said Yeah”, while “Bony Moronie” became a staple of rock ‘n’ roll bands the world over. This 32-track CD comprises every track he released, naturally including all those well-known titles, during this first and most important period of his career up until the time that he was incarcerated for drug offences at the start of the ‘60s, and as such it is a definitive cross-section of his work and an entertaining slice of classic rock ‘n’ roll.